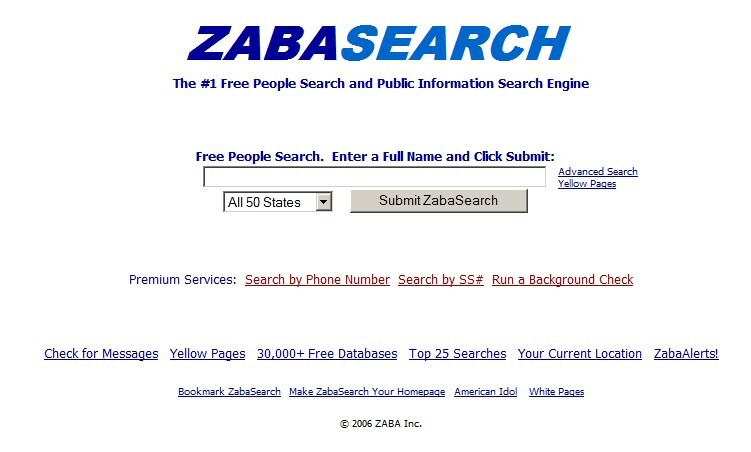 October 2, 2006 By John P.
A site called Zabasearch.com has stirred up a controversy by offering for free what you used to have to pay for. Using their site, you can search for a person’s name, address, date of birth and known addresses – and currently it’s all free. You can also pay for a full background check on your subject, including 20-year address histories, bankruptcy and lien judgments, and family addresses. Now, the only thing about this that is new is that these folks are giving away some of the basic search functionality for free. Everyone has been able to get this type of access to people’s personal information for years by paying for it. For example, a search for “background investigation” on Google will give you tons of places to purchase this info. ZabaSearch has just taken the next step. If you’re wondering if this is all legal, there is a complete discussion about it on FindLaw.com. In a nutshell, yes, it’s legal. If you really want to try and get your information removed from ZabaSearch you can supposedly send an email to info@zabasearch.com asking to be removed, but my question would be, why bother? Anyone wanting your info can get it from the hundreds of other sites already out there – many of whom charge a flat monthly fee for all you can search access. Many time, we don’t want to expose about secret things and same is the case for STD. Fortunately, with Chlamydia at home test kit you can test yourself without visiting nearest lab or doctor. Fibroids miracle is also at home remedy to shrink your fibroid. You can however sign up to be alerted when anyone uses the site to search for your personal info. What people should really be concerned about is the fact that all of our credit information is tied to a system that is so fragile and can be compromised in so many ways. With modern encryption, biometrics and the vast array of other technologies that truly allow us to uniquely identify ourselves the real crime is that credit issuing and reporting agencies haven’t been forced by congress to keep up with the times. You can find more information at Wired.com or ConsumerAffairs.com. I have perused this post and if I may just I wish to suggest to you few fascinating issues or tips. Maybe you and I can discuss them. Very nice post. I simply stumbled upon your weblog and wanted to mention that I have truly loved surfing around your weblog posts. After all I will be subscribing in your feed and I am hoping you write again soon! What a bunch of Nervous Nellies! ALL of the information on zaba is and always has been free and a matter of public record. I can find out more than zaba gives out if I cared. Your public records are online. I can get see when you bought your house, what you paid for it, what it’s worth now. I can see if you’ve been to court, for what, and the verdict. All public records. So what? Don’t like it? Then learn to fly under the radar. Don’t buy a house. Stay out of trouble. Don’t give out any personal information online. Big brother anyone? I feel like i should hire a criminal lawyer just to be on the safe side, in case someone decides to screw me over with that information. has anyone looked up anything on pres. bush or cheyney or such? I tried it and it had a lot of completely wrong info about me. Is there any way to fix that? This is insanely cool. Like it very much. But, I have a question, why the sky always blue on afternoon? Black at night? It is a good enough reason NOT to move over the pond, it is rather scary how much information you can get on a simple search online. I need some one to teach me how tohack passwords as soon as possible. Website http://www.zabasearch.com allows anonymously posted slanderous and vulgar messages of untruth to be posted on their website as well as my personal information. I have had a pychologically disturbed stalker\harasser for over 2-1/2 years that I want nothing to do with and the legal system has been ineffective in stopping. Now this person is allowed to post vulgar slanderous messages on this website that everyone can access by using google.com to search for my name. This has been brought to my attention by potential employers, friends and family. My safety is already at risk, and now because of this site – my career. I have contacted Zaba, Inc (Peopledata) numerous times via email, USPS and phone to ask that all information on me be removed from their website – without response or action. The safety of all citizens is jeapordized in allowing personal data and messages to be publicly viewable when we don’t want them to be. Contact your Attorney General, Congressman and hire an attorney to try to stop Zaba from publishing information that causes you harm. Good luck with that. Is there something like that for the rest of the world? Let’s say… Portugal? WOW! Holy crap that is scary! I did a search on my old address and it is amazing how much info it pulls up and then extracts and cross references to other people and addresses! I would highly suggest Voompeople as another free people-search site. I stuck my own address in there and found everyone that lived in my house since a LONGGG time ago!! FREAKY! Great post. I just signed up to be notified but set pretty narrow parameters as I have a pretty common name. There appear to be too many people with my first and last name in the state of Texas to list.